As winter turns into spring, students are taking advantage of the warmer weather. 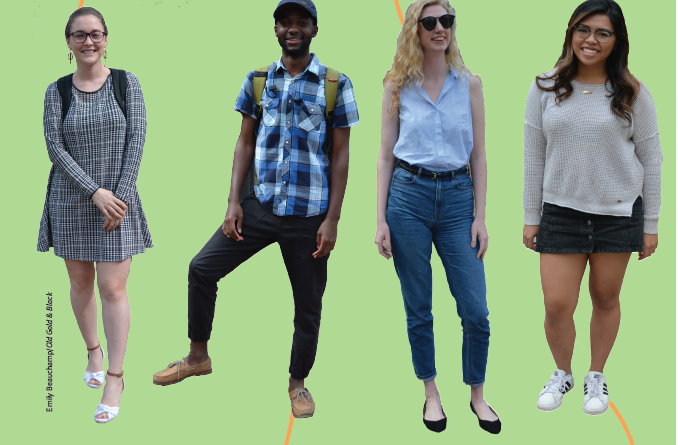 During this transition period, dresses, short sleeves and casual jeans are beginning to pop up around campus. O’Brien’s outfit is the perfect way to stay warm during those cool spring mornings while still being prepared for the hotter afternoons. Sporting a long-sleeved dress paired with white sandals, her outfit is functional for all hours of the day. Sporting a casual plaid button down and black jeans, Thompson embraces the fluctuating temperatures that come along with spring. As sunny weather is now expected, he sports a hat and cool blues to avoid the heat. Hayes transforms the average comfy sweater into a spring-styled ensemble by adding a jean skirt. Paired with white tennis shoes, her outfit is perfect for attending class or heading off-campus for the holiday weekend. March takes advantage of the first warm day of spring by wearing a casual tank top and comfy high-waisted jeans. She keeps the sun out of her eyes with a pair of black sunglasses and sports a pair of black flats to match.